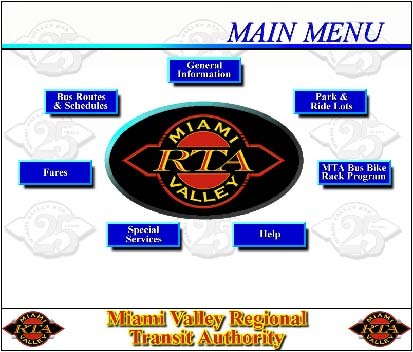 Miami Valley Regional Transit Authority (RTA) provides public transportation services to the greater Dayton, Ohio area. RTA is implementing a transit hub system to better serve all areas, urban and suburban. FutureTouch is providing interactive kiosks for four transit hubs to improve public access to service information. A fifth kiosk is located in the Dayton Jobs Center. FutureTouch kiosks provide interactive access for routes and schedules, fares, disabled services and other features. A telephone hotline provides instant access to a live customer representative.